I've featured Cecilia Peartree before on this blog, but she's so prolific it's about time to do it again! Her latest book, the fifteenth (not counting shorts) in the Pitkirtly series, Murder or What You Will, is just out and is another delight. 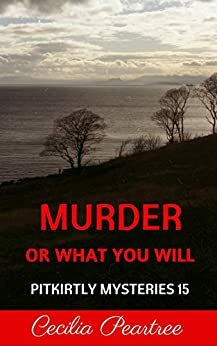 Set in and around the fictional coastal village of Pitkirtly in Fife, notoriously riven with murders and miles from any ambulance provision, the books feature Christopher, a nervous archivist, and Amaryllis, a semi-retired spy, along with their various aging friends and neighbours and their dogs. Council politics, local trades, knitting and family history crop up often in the plots which are bulging with in - jokes and insecurities. The series is well worth reading from the beginning (and indeed I am rereading it) for a bit of feelgood, neighbourly murder and a pint or two of Old Pictish at the Queen of Scots. Cecilia has another series and further books available: the Quest series is set in postwar times with a backdrop of art. Beginning with The Lion and the Unicorn Quest, it has Flora and Oliver Quest as the main characters, a young couple meeting and marrying in London. Oliver is a policeman turned artist, and Flora had an interesting war against which the peacetime world is a little dull. Oliver's sister Clemency, a brilliant mathematician, also features and is perhaps my favourite character - A Quest for Clemency is also my favourite in the series. This series is beautifully researched and the historical setting is perfect.